I am on my way to an appointment at Cremona’s international school of violin-making in Palazzo Raimondi, a 16th-century building in the historic core of the city, to see budding violin-makers taught by the descendants of the old masters. I enter a workshop where several young people are bent over violins, carefully crafting their instruments. 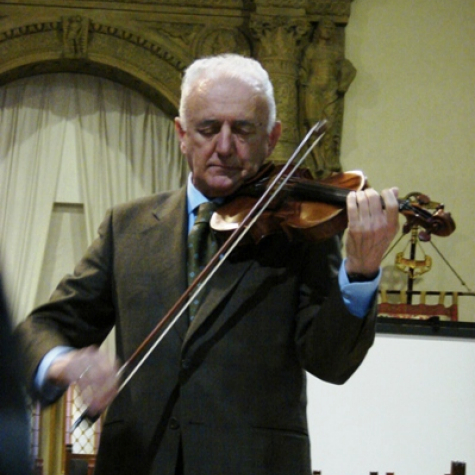 Giorgio Scolari, for 30 years supervising teacher and violin-maker and the vice principal of the school, is my guide. ‘We currently have some 140 students,’ he explains. ‘Eighty percent are from overseas. They learn the Cremonese art of violin-making over four years. It takes a whole academic year to complete one instrument.’ I want to know how closely they follow the methods of the old masters. ‘As you can see, there are no machines, every stage is carried out as close to the traditional procedures of the masters as possible,’ he says. I linger in the workshop fascinated by the passion and perfection with which the students tackle their art. They listen to the instructions of Signor Scolari with utmost care and correct the imperfections instantly. I ask Scolari where I can listen to a Stradivarius. ‘Try Palazzo Comunale at midday,’ he suggests. I soon find myself sitting in an austere salon of the 13th-century town hall waiting for the start of the shortest concert I have ever attended. A solemn, white-haired maestro, carrying a Stradivarius violin as if it was a new-born baby, makes his appearance. A reverent silence falls on the audience occupying the whole of the sizeable hall. As the maestro moves the bow, delicate notes emanate in stints and waves. Seconds later the music penetrates the skin, begins caressing the pleasure centres, faces assume beautific expressions. At the end of the 12-minute concert, the public erupts into an applause that seems to go on for as long as the performance itself. The brief recital is followed by a guided tour of Palazzo Comunale. In one room stand five violins and a viola proudly posing behind glass casements The guide explains they were constructed by Andrea Amati (1566), his sons Gerolamo and Antonio (viola, 1615), grandson Niccolò (1658), Giuseppe Guarneri (1689), his son Giuseppe Guarneri del Gesù (1734), and Antonio Stradivari (Stradivarius) (1715). She takes it for granted that everyone knows these masters were born in Cremona, but underlines, ‘Three families of violin-makers are responsible for the invention of the modern violin. The best, the most sought-after violins to this day came from their workshops.’. The recital I heard is a daily ritual to maintain the acoustic qualities of the instruments. I ask Andrea Mosconi, the solemn maestro whose job it is to carry out this ritual, what differences there are between these violins, bearing in mind they were made by different masters over a period spanning nearly two centuries. His response is as crisp as his performance was fluid, ‘More than differences, I’d point out what unites them. They all have a Cremonese sound.’. The revival of violin-making in Cremona is a relatively recent phenomenon. It all began in 1937 when commemoration celebrations marking the bicentenary of Stradivarius’s death were planned. From far away places like London, Paris and New York 136 instruments arrived in Cremona. Forty-one were by Stradivarius, including his first violin dated 1667 and the last he made in 1737. There were 11 by Guarneri del Gesù and six by Niccolò Amati. The rest were signed by lesser-known but not necessarily lesser-valued Cremonese masters of the 1600s and 1700s. On the 15th of June 1937 at Cremona’s A. Ponchielli theatre, a still-talked-about concert took place. The music of Corelli, Bach, Vivaldi and Boccherini was played using the old instruments exhibited in the city. Twenty four Stradivarius, nine Guarneri and one Amati in a joint effort produced such divine music that the concert made headlines around the world. In September 1938 Cremona’s traditional violin-making school was launched, only to be interrupted for a decade by the Second World War. In the 1950s it picked up momentum and went from strength to strength. It inspired and renewed passion for making violins in the tradition of the founding fathers. The handful of violin-makers in the 1960s has today grown to some 100 workshops where the ‘new masters’ and their apprentices make or restore mainly violins but also violas and cellos. 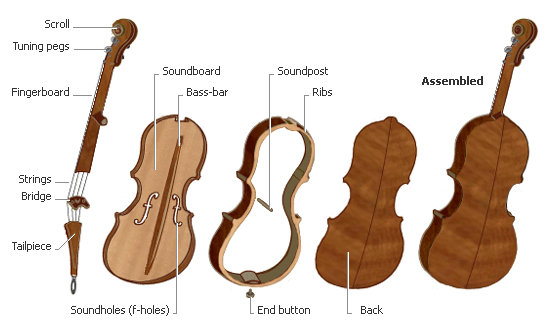 As the annual production of a violin-maker is around ten instruments a year, most work is commissioned, and the waiting list can be as long as 6 months to a year. I wonder what a new Cremonese violin would cost. ‘Between 25,000 and 212,000,’ I am told. The golden age of violin-making in Cremona began with Andrea Amati (1505-1577) who is considered the inventor of the modern violin. His grandson Niccolò Amati (1596-1684) made significant acoustic and aesthetic improvements, Guarneri del Gesù (1698-1744) made robust instruments with a powerful, rich sound, qualities so admired by the virtuoso violinist and composer Paganini that he owned four of them. But the city owes its fame to the inimitable master of all time Antonio Stradivarius (1644-1737). Stradivarius crafted around 1,100 string instruments, mostly violins, of which half are still in existence. He became rich and famous in his own lifetime, violinists and collectors alike started salivating over his instruments soon after he set up shop in Cremona in 1670. In 1990 a Stradivarius violin was sold for a record $1.4m; in April 1998, Stradivarius broke his own record when his violin ‘Kreutzer’, auctioned by Christie’s in London, fetched $1.58m. The owner had paid $24,000 for it in 1958. Alas, Kreutzer’s primacy didn’t last long. On 1st November 1999 the Swiss music dealers Hug announced that the violin owned by Yehudi Menuhin (1916-1998), a 1742 gem by Giuseppe Guarneri, had just been auctioned for $2.83m. The question of what exactly makes a Stradivarius violin so extraordinary has plagued violin-makers to this day. The fact that he used a more prominent scroll, made the corner blocks more massive, increased the curvature of the middle ribs, reduced the arch of the belly, and modified the f-holes may be easy to see and imitate, but why is it that the results are nowhere near the master’s? I put the question to Fausto Cacciatori, an experienced violin maker and restorer in Cremona. He reveals that the essential difference is the three-phase varnishing technique Stradivarius used. Apparently he mixed silica and potash and applied the resulting glassy liquid to the assembled violin. The liquid entered the pores of the wood and wrapped around the fibres giving the violin a robust constitution, the main reason such a large number of Stradivarius instruments have survived. Why the violin was invented and thrived in Cremona for 200 years and faded away for just as long before making a comeback will remain a mystery. Today, walking around Cremona, violin-makers’ workshops crop up frequently, whiffs of varnish tickle nostrils, instruments may hang from the ceiling or on a balcony to dry, shop windows display what’s on offer. A bronze statue of Stradivarius dominates a major square in the city centre, a marble slab in a small public garden recalls where he was once buried, a plaque on a house points out where he lived, a museum exhibits his tools and plans as well as old and new instruments made in Cremona. 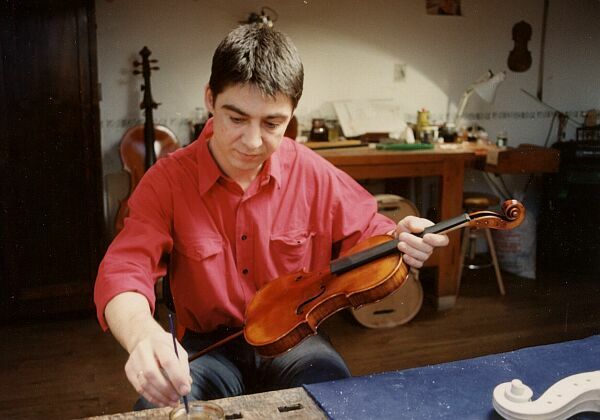 Every three years the city holds an international violin-making competition named after Stradivarius. But the spirit of Stradivarius, and other Cremonese masters, is kept alive in the daily recitals by maestro Mosconi at Palazzo Comunale.